Guide to Pottawattamie County, Iowa ancestry, family history, and genealogy birth records, marriage records, death records, census records, family history, and military records. The County was named for Potawatomi tribe. The County has Council Bluffs as its seat and the County was created September 21, 1848. The County is located in the southeast area of the state. Apparently the new county, covering over 5,000 sq. 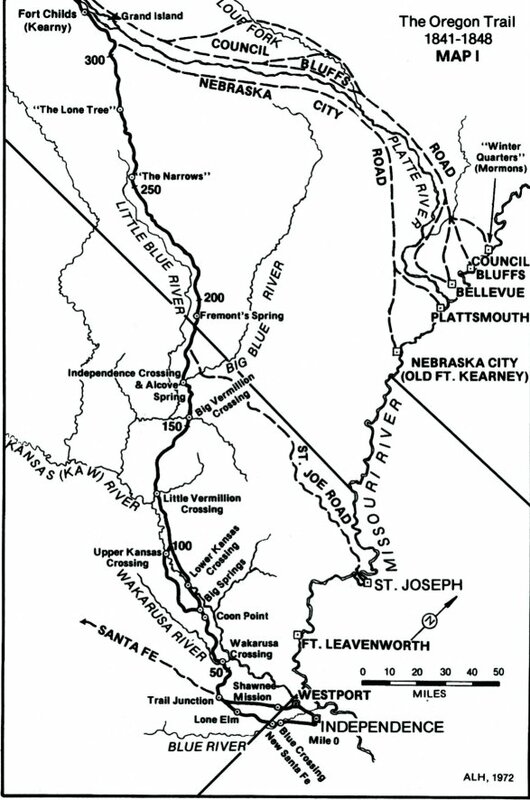 miles, once included nearly all of Iowa's Missouri River drainage between the southern halves of what are now Monona and Crawford Counties and the northern edge of Fremont, Page, Taylor, and Ringgold Counties. The following counties were completely formed from within this expanse: Harrison, Shelby, Cass, Mills, Montgomery, and Adams; most of Audubon, along with portions of Union, Adair, Guthrie, Carroll, Crawford, and Monona Counties were also part of Pottawattamie County until 1851. However, the area near Mt. Pisgah was never in Pottawattamie County. Iowa's legislature gave the eastern half of today's Union County to Clarke County in 1846, then shrank both Clarke and neighboring Lucas County in 1847 (before either county became functional). As a result, the Mt. Pisgah community and cemetery were in a non-county area until Union County was formed in 1851 and organized in 1853. Cemeteries, grouped by search site. Information on search sites may vary from site to site, but usually at least has the name, most will have dates, and some will include epitaphs and other information. Some include photos, some do not. Indexing of headstone data and locations will also vary, completeness of coverage of any particular cemetery may also vary. Records of the American Lutheran Church, Council Bluffs, in Evangelical Lutheran Church in America database at Archives.com ($). Records of the St. Paul's Lutheran Church, Neola, in Evangelical Lutheran Church in America database at Archives.com ($). Records of the American Lutheran Church, Underwood, in Evangelical Lutheran Church in America database at Archives.com ($). Local histories are available for Pottawattamie County, Iowa Genealogy. County histories may include biographies, church, school and government history, and military information. For more information about local histories, see the wiki page section Iowa Local Histories. History of Pottawattami County, Iowa, from the earliest historic times to 1907. By Homer H. Field and Joseph R. Reed. Chicago : S.J. Clarke Pub. Co., 1907. Online at: Vol. 1 FamilySearch Books Online, Google Books, Vol. 2 FamilySearch Books Online, Interner Archive; At various libraries (WorldCat). History of Pottawattamie County, Iowa : containing a history from the earliest settlement to the present time... biographical sketches. Chicago : O. L. Baskin, 1883. Online at: FamilySearch Books Online, Internet Archive, Google Books; At various libraries (WorldCat). Mormons at the Missouri, 1846-1852 : "And should we die. . .". By Richard E. Bennett. Norman, Oklahoma : University of Oklahoma Press, c1987. Online at: FamilySearch Books Online; At various libraries (WorldCat). FamilySearch. Do a Pottawattamie County, Iowa Genealogy Place-name search for these and other records in the FamilySearch Catalog (For instructions see, FamilySearch Catalog Place-name Search). The FamilySearch Catalog lists films of probate records. To find the records for this county, use the Place Search for Iowa - Pottawattamie - Probate records. ↑ Wikipedia contributors, "Potawatomi, Iowa," in Wikipedia: the Free Encyclopedia, "https://en.wikipedia.org/wiki/Pottawattamie_County,_Iowa." ↑ Handybook for Genealogists: United States of America, 10th ed. (Draper, Utah: Everton Pub., 2002), Pottawattamie County, Iowa. Page 230-238 At various libraries (WorldCat); FHL Book 973 D27e 2002; Alice Eichholz, ed. Ancestry’s Red Book: American State, County, and Town Sources, Third ed. (Provo, Utah: Ancestry, 2004), 222-225.